Hat-tricks from Hossein Tayebi, Asghar Hassanzadeh and Mohammad Shajari helped 10-time AFC Futsal Championship winners Iran secure passage into the semi-finals following a 15-4 win over hosts Vietnam on Wednesday. Iran found themselves 5-1 up at half-time at Phu Tho Stadium with Tayebi scoring twice while Vahid Shafiei, Shajari and Alireza Vafaei were also on target. Vietnam scored four times themselves through a double from Phung Trong Luan and further goals from Pham Thanh Dat and Ly Khanh Hung, but 10 goals in the second half from Iran highlighted the gulf in class between the two sides as the 10-time winners maintained their 100% record. 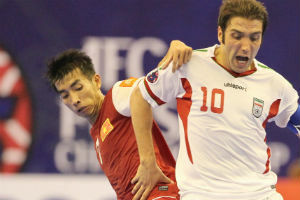 Iran started stronger, with Vietnam happy to sit back and defend, and found a way through when on three minutes when Tayebi received the ball with his back to goal and was able to spin around an out-rushing Dang Phuoc Anh and roll the ball in from a tight angle. The goal, though, appeared to spark the hosts into life and they almost found themselves level when Ngo Ngoc Son capitalised on a slip from Hamid Ahmadi, but with just the goalkeeper to beat, he could only fire the ball at Alireza Samimi’s body before Nguyen Boa Quan blazed over from close range a minute after. Moments after Le Quoc Nam then saw a shot hit the post for Vietnam, but Iran doubled their lead when Phuoc Anh was unable to keep hold of a powerful shot from Farhad Tavakoli and the ball spilled to Tayebi to score his second of the match. Vietnam had another chance to score on 11 minutes when Thanh Dat caught Tavakoli in possession but his effort was again blocked by Samimi. And from that rebound, Iran broke quickly and when Shafiei drilled a ball across the area Vietnam goalkeeper Phuoc Anh was left red faced as he deflected the ball into his own net. The hosts did reduce the deficit a minute later when a shot was parried by Samimi and Trong Luan was able to poke the ball in from close range. But it took Iran less than 10 seconds to restore their three-goal advantage when Ahmadi squared a ball into the penalty area for an unmarked Shajari to side foot home. Samimi was called into action to deny both Bao Quan and Ton That Phi to maintain the advantage before Vafaei scored Iran’s fifth in the 16th minute. Khanh Hung, though, ensured Vietnam were first to score after the break with a fine solo effort in the 22nd minute from near the half-way line which keeper Samimi could do nothing about. But three quick fire goals, which included Tayebi completing his hat-trick and two goals from Asghar Hassanzadeh in the 25th minute, finally put the game out of Vietnam’s reach. Hassanzadeh then wrapped up his hat-trick with a spectacular effort from inside his own half which lobbed over substitute goalkeeper Tran Buu Phuoc. Trong Luan did pull another goal back for Vietnam in the 28th minute when he saw his initial shot saved by Samimi but followed up to hit the ball into the roof of the net. Iran, though, hit double figures on 30 minutes when Mohammad Taheri saw his shot hit the post and Shajari was on hand to turn home the rebound. With Vietnam still intent on pushing forward, Shajari turned provider for Behroz Jafari for Iran’s 11th goal. 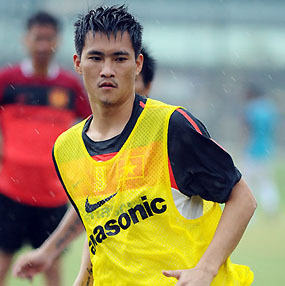 Tavakoli and Shajari then combined to cut out goalkeeper Buu Phuoc for the 12th goal as the latter completed his hat-trick. Vietnam struck back for a fourth time on 34 minutes through Thanh Dat, but Vafaei restored the advantage when he got his second on the break three minutes from time. And Farhad Fakhim completed the rout with two goals in the 37th and 38th minutes to seal Iran’s fourth win in as many games.